it is a new year, and time to start a new cycle of meetings! The meeting is on Sunday, Jan 28th at 6PM, at Norma’s Cafe in Plano, near Rt. 75 and 15th street. We have a new year of activities, including the upcoming Dallas Science Fair judging, and longer term planning for Moon Day, and of course, URC. 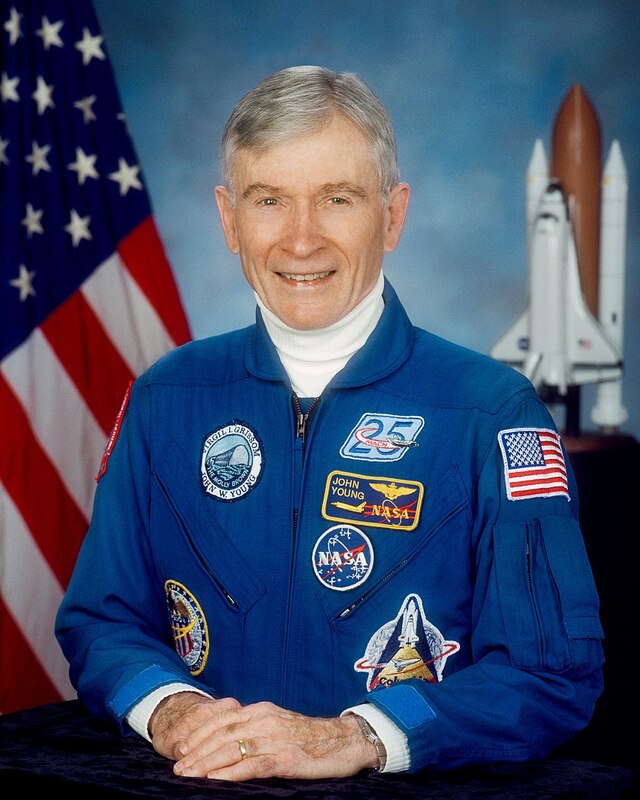 We noted with sadness the passing of John Young, Apollo 16 moon walker, on Jan 5 of this year. This leaves only 5 moon walkers left (Buzz Aldrin of Apollo 11, Alan Bean of Apollo 12, Dave Scott of Apollo 15, Charlie Duke of Apollo 16, and Harrison Schmitt of Apollo 17), less than half the original 12, and now no crew has both Moon walkers left. John Young also orbited the moon in Apollo 10, meaning that with his passing there are only two of the three original ‘double moon shot’ astronauts. What this means is that the Apollo generation, the one that inspired so many (including me) and left such giant footsteps to follow, is fading into history. Replacing them is a new generation of explorers, progressing forwards without the huge scrutiny, public fascination, or giant (and fickle) government budgets, but whose progress and impact promises to be a steadier, more lasting one. The same month that John Young passes looks to be the first engine test, and very soon after that, the first launch, of the Falcon Heavy. The largest rocket in terms of payload since the Saturn V, its launch will herald an era where the US has the heavy lift capability needed for manned space exploration. Only, totally unlike the Saturn V, the Falcon 9 Heavy is a privately funded rocket, developed in a fraction of the time, cost, and manpower of its historical ancestor. Behind it is the New Glenn and New Shepherd from Blue Origin, and the NASA SLS. The first deep space mission for the Falcon 9 Heavy is already booked – a manned mission to fly by the moon, paid for by private individuals. Blue Origin’s New Shepherd looks to be ready for manned test flights in a year or two, and SpaceX and Boeing look ready to put astronauts back into space with American hardware by 2019. A small New Zealand company, Rocket Lab, just put their first rocket into orbit In other words, space exploration is shifting to many private firms that will soon make space travel far more numerous and cheaper than the giant government programs of before could ever make possible. It may not seem like it today, but I think we are on the cusp of a new age of space exploration, bigger and faster than the Apollo that awed me as a child. See you Sunday. It is going to be a good year.